Today I’d like to introduce you to my Aunt Debi, who is not actually my Aunt Debi, but she said I should call her that anyway. I discovered Aunt Debi because she comments on my Instagram pics with the frequency of a stalker. I clicked over to her instagram account (@thegardenofeatin) to see if maybe I should call the cops and instead, discovered her awesome food photography. It’s colorful and playful and kinda looks like maybe I could make some of her recipes without four years of french culinary school. I’m not exactly a wiz in the kitchen. I told my friend Seri (Little Miss Party) about her and she was like— YA. THAT’S MY AUNT DEBI. We’ve met in real life a few times. She just didn’t introduce herself with her instagram handle. I hear most people don’t. Anyway, Aunt Debi posts her beautiful food pics on instagram but doesn’t have a blog to write up her recipes, so I offered her a place to write them here. She said, “OH MY GOD, SERIOUSLY???? I WOULD LOVE TO!!!!! THANK YOU!!!! !” like any good stalker would. Then we were talking about ideas and I mentioned how Harlow and Mazzy both only eat half of their bananas but refuse to share so I always have these disgusting half bananas dying in my fridge that nobody wants to touch. That’s how we decided to do a post about what to do with a dead banana. Once you get to know me a little better you’ll understand that being a serial banana collector isn’t such bad idea. It’s risk free, easy and there’s no chance of being arrested for possession of dead bananas (unless you steal them, of course). NO ONE TOUCHES MY DEAD BANANA. Dead Bananas are what I call the MONEY banana. They have large brown spots or can be completely brown. They are soft, sticky, sweet and can be easily mashed into milkshakes, baked into breads and cakes, and mixed into pancake batter. It’s only when they get to this stage, they are allowed to join the collection in the museum section of my freezer. Banana Tip #1– To speed up ripening, put them in a paper sack with an apple. Apples produce ethylene gas that ripens fruit. Banana Tip #2– To slow down ripening, put them in the refrigerator. The skins will still darken, but the fruit will stay firm a few extra days. 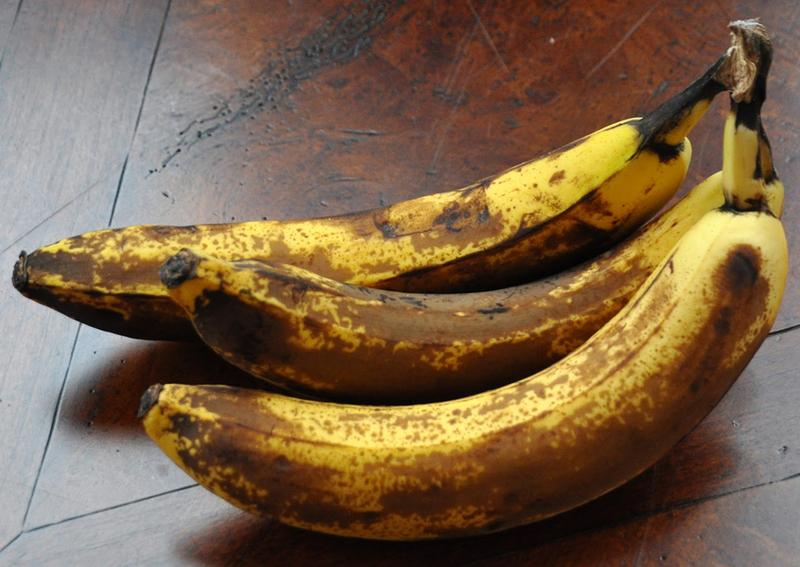 Banana Tip #3– If you stick your dead banana in the freezer, don’t freak if the skin turns black. That helps protect the fruit from freezer burn. Don’t you wish they made big puffy banana skin coats for winter? When you’re ready to use them, leave yourself about an hour to thaw them out. Best thing ever is watching the banana guts slide out from their skin… it’s like something out of The Exorcist. Ready to put your thawed dead banana to work? Add frozen banana to any flavour yogurt. Then blend and place in ice pop molds. Freeze for 4 hrs. Dip in melted chocolate and decorate with sprinkles! Frozen bananas, frozen berries & any flavour yogurt – blend and serve. Heat oven to 375 degrees. Grease and flour 10×15 jelly roll pan or line with parchment paper (for thicker bars use a 9×13 pan). Beat first four ingredients until creamy. Blend in bananas and vanilla for one minute. Add dry ingredients and blend for one minute. Stir in your optional nuts and spread in pan. Bake 20 to 25 minutes until golden brown. Cool slightly until you can’t keep anyone out of the kitchen, cut a piece for yourself (hide it) move aside, then let the vultures descend. Yes that’s right… one peeled and chopped ripe banana is all you need! Freeze the banana, then puree in food processor until you reach ice cream consistency. This requires patience but it’s worth the wait. Honestly? Even if you can’t boil water you can make this recipe. For a nutty and chocolatey twist, you can add 1 tablespoon peanut butter and/or 1 tablespoon unsweetened cocoa powder. Add a mashed ripe banana to your favorite pancake recipe! You do know how to make pancakes, right? For more of Aunt Debi’s delectable photos, follow @thegardenofeatin on Instagram. Debi Traub is a working mom of 3 boys (ages 28, 26 & 23). Her passion has always been cooking and baking, most likely the reason her grown children still live at home! She credits her cooking skills to her 92 year-old mom who never measures anything in her recipes. Debi likes creating appealing food with very few ingredients, a trick that takes creative thinking but can be done. I look forward to featuring more of her recipes in the future! Thank you! I always feel so guilty about ditching the nasty bananas. Save the bananas! Awesome ideas! Thanks! My husband always adds 5 bananas (or more) to our weekly shopping list even though he never makes it through more than 2 or 3 before they become dead bananas! You would think he would learn (or at least listen to my rational argument each week), but no. So we waste so many bananas! Can’t wait to put these recipes and dead bananas to good use! The pictures are just gorgeous! they can also be made into amazing banana bread. I currently have a small collection of bananas in my freezer too. What’s a dead banana? I have a house full of monkeys. Cannot keep bananas stocked. I’ve made the popsicles and even banana ice cream using coconut cream in the BlendTec. It is delicious. Always use frozen bananas in my smoothies. We slice them and freeze on a 1/2 sheet in Ziploc(c) Perfect portions bags. Then after frozen we gathers them up and place in a large Ziploc(c) freezer bag for our smoothies. The only problem I have with bananas is buying them ripe. Why is it that when I go, they are usually over-ripe or green? I think I’m going to be a big fan of Aunt Debi! I have never frozen a banana and I’m sure going to try. Do they have to be dead before you freeze them? We go through so many bananas here in a week I would have to hide some before they would ever go black! But one ingredient ice cream?… genius!!! I think Aunt Debi needs her own food blog! I took a look at her pix and wish she’d include the recipes! Hi Linday! Stay tuned! It’s going to happen one day if i can hire a student to manage it! Yay! These recipes sound great! I’ve got a bunch of bananas in my freezer too. I needed a good solid food instagram account to follow. Thanks! When I can keep bananas around long enough to do so we love some good old fashioned banana pancakes at our house with peanut butter and real maple syrup! Going to have to try and hide a few to make the banana pops at the top!